Should We Replace Workers With Robots to Save Energy? Technology has made it easy to justify replacing some jobs with electronic counterparts for the sake of saving money, but this is the first instance we’ve seen of a company replacing workers with robots to supposedly save the planet. 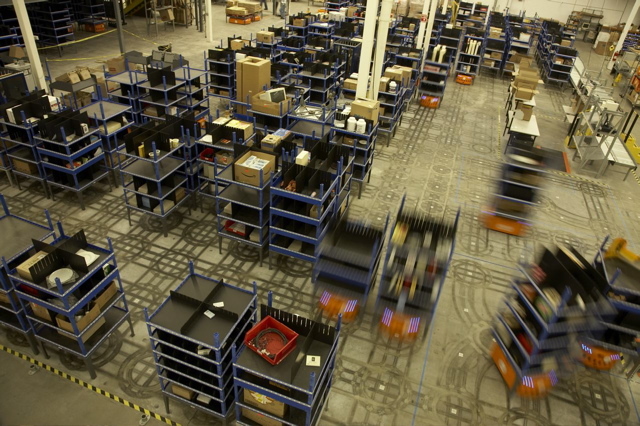 Crate & Barrel recently announced that it is installing a Kiva Mobile Fulfillment System (MFS) for automatic order fulfillment and warehouse operations at its Tracy, California distribution complex. In addition to being time efficient, Crate & Barrel also claims that the system is ultra energy-efficient. And how is using electricity-powered robots greener than having real, live humans pick, pack and ship orders? The “robot zone” can be operated without lighting, which human workers obviously need. Add in the fact that each robot only uses as much electricity as a laptop to zip around with inventory, and Crate & Barrel has a pretty good, green reason to replace us with the robots. Crate & Barrel isn’t the first company to use Kiva’s system. Saks has 700 of the robots in one of its fulfillment centers and says that it has led to a 50% rise in productivity compared when the warehouse used human workers. But how long can it be before managers start justifying layoffs by saying it reduces the company’s carbon footprint?